The trains on the Wirral line run on a loop from the four destinations: West Kirby, New Brighton, Chester and Ellesmere Port. They leave the four individual destinations at regularly spaced intervals - usually every 15 or 30 minutes during the day - going via the four Liverpool stations - Moorfields, Lime Street, Central and James Street. The units are Class 507 three-car Merseyrail EMUs. The train leaves Liverpool Central at 11.40 having started its journey thirty minutes earlier at West Kirby Station, over on the north western tip of the Wirral peninsular. The train is a 3-car EMU unit, though I'm not too sure that I like the way the seats are arranged, making it hard to see clearly out of the windows unless you are seated facing backwards. Liverpool Central has always been on two levels with trains from Hunts Cross in south Liverpool terminating at the original street level Central station, until a modernization programme in the 1970's connected this line with the Southport line forming the Northern Line from Southport and Ormskirk to Hunts Cross. This meant new tunnels were built for a continual line, whilst Liverpool Exchange station was closed down. Deeper underground, the Wirral line was already in place, terminating at a Liverpool Central low-level station. The modernization that took place meant an underground loop was built from James Street via new underground stations at Moorfields and Lime Street to Liverpool Central. New units introduced in 1983 meant that they could be used on any line in the Merseyrail network, which had used the 3rd rail dc volts system since 1903. There is just the one platform at Liverpool central Wirral line station and there are tunnels at either end of the platform, as the whole of the Wirral line is underground from Birkenhead via the River Mersey tunnel into and out of Liverpool. The next station is James Street, which has two separate platforms for trains going into central Liverpool and out again. The line then drops under the River Mersey before coming into Hamilton Square station in Birkenhead. This is just a few yards away from the old station of Birkenhead Woodside, which used to be the terminus of the GWR line from London Paddington. All the Merseyrail Underground stations are similar in design with brown being the dominant colour of both the platform and the walls, with strip lighting giving light to the platform areas. 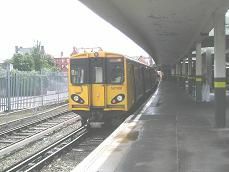 Hamilton Square station is divided up into three platforms as the line divides into lines for Chester/Ellesmere Port and lines for West Kirby/New Brighton. We continue in another tunnel as the line moves sharply to the right and uphill causing the wheels to screech, until we reach a new station in Birkenhead, that of Conway Park, which was opened in ? It is partly open air with large concrete beams allowing daylight into the otherwise underground station. You can tell we are still deep underground as there are signs that proclaim, "99 steps to the street." We go into a final tunnel before we emerge shortly before Birkenhead Park station, which is an island platform with a large single bus shelter on its double platform. Also noticeable is a large clock on a post on the platform and station signs which say, "Birkenhead Park - for the world's first public park", and "Birkenhead Park - for the Docklands". We then leave the station and enter a low cutting, with the line going to both the left and the right before slowing for Birkenhead North station. The track here is wide enough for a third track and indeed there are three platforms here - a main one and an island one. It is the first station of the route to have its original station building still in place, though many of the windows are covered in bars. Soon after on the right we pass the depot and extensive sidings for the Merseyrail units. The line for New Brighton then veers off the to the right as we leave the town of Birkenhead behind and come into rough pasture land with horses grazing and streams running by the side of the track on the left. In the middle of all this is Bidston station, which is an island platform and also the terminus for the line from Wrexham. It is built of white wooden cladding and the signs say, "Change here for the Borderlands Line". That line veers off to the left as soon as we leave Bidstone and then we pass under the M53 motorway. There is a golf course on the right and more fields on the left, though there is still plenty of housing in the distance, including a couple of high rise blocks of flats. Housing soon appears on both sides of the track once more, as we arrive at Leasowe station, which is the other side of a level crossing. The station sign says "Leasowe for the Wirral Coastal Park" with a picture of a sea bird. This and the following stations are all built in post-modern 20th century design with large white curved glass shelters and the yellow Merseyrail livery. There is no graffiti to be seen, though the fences are made of green wire mesh. As we leave the station we pass the Typhoo Tea factory on the right and travel just a short distance before we reach Moreton, which is identical in design to Leasowe station. There is the inevitable builders merchants yard next to the station on the left, whilst in the distance on the right there is the remains of a large white lighthouse beyond the sand dunes, which are prevalent here. The train starts to speed up for the first time reaching 50 mph as we pass through open fields on both sides. We stop next at Meols, which has a large pond on the south side of the station, adding to its beauty. There are still open fields on the left as we depart, but housing on the right. Soon after we stop at Manor Road on the outskirts of Hoylake. Once again it is the same design, though there is some light industry on the left soon after the station. It is only a short distance to Hoylake station, which must be the prettiest station on the line, with many flowers in tubs and baskets on both platforms. To the south of the station can be seen a variety of telegraph poles which are part of an electricity sub-station. As we leave Hoylake, the line curves to the south, as we pass a golf course on the left and on the right an impressive array of large detached houses can be seen. We travel for a mile or so before we pull into West Kirby station, which has two platforms on an island. There is a six-car unit on one platform and our train pulls into the other platform, waiting for almost ten minutes before starting its journey again.